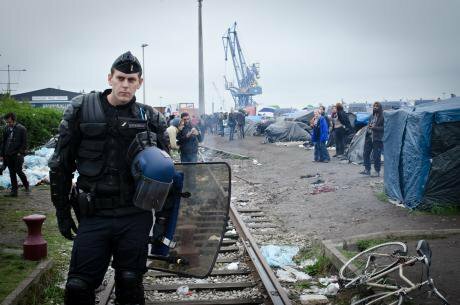 Police and migrants in Calais, France. Jey OH photographie/Flickr. Some rights reserved.The last two weeks have seen the continuation of a dual conversation on refugees, one that has been both inclusive and exclusive at the same time. The duality of such discussion is nothing new, indeed across much of Europe sentiments of compassion and responsibility mix with concerns over security, resources and the political rhetoric of the centre and far right. The most recent emergence of this tension has been around the situation of refugees in Calais. 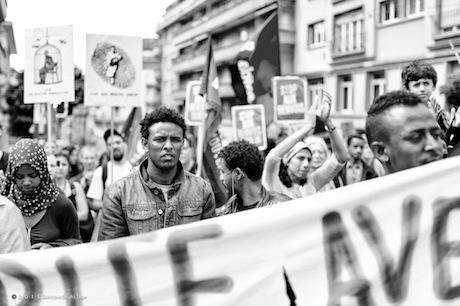 On the one hand, advocacy groups, charities and migrants rights movements have all sought to place the supposed ‘crisis’ in a wider context of European migration and look to longer-term solutions for those displaced. On the other, short-term policy fixes that rely on building higher fences, further restricting access to asylum and passing responsibility for refugees between EU states have proved more politically palatable. Meanwhile, debates within the UK cannot be divorced from the wider European picture, wherein EU foreign and defence ministers continue to discuss plans to address the refugee crisis in the Mediterranean. Rather than emphasising the potential contributions of such refugees, these discussions have also been marked by a reluctance to view refugees as anything more than a ‘burden’ to be shared between reluctant hosts. Whilst immediate responses are sought, in the longer term discussions of regularised routes into Europe for those fleeing conflict are set to be a key political battleground. In a context of deadlock and intransigence from nation-states over their willingness to take part in refugee resettlement, it is notable that the voices of other actors within any possible EU-wide policy have been muted. Perhaps most significant are the voices of those cities which are expected to play a central role in refugee resettlement. As such, it is worth asking how European cities may position themselves on this issue. A revival of the tradition of European cities as sanctuaries for the oppressed may be some way off, but with refugee resettlement often an urban phenomenon, there may be scope for creative and progressive openings – openings that do not automatically replicate the closures of policies devised by national governments keen to absolve themselves of responsibility for the displaced. "Cities in arrival, transit and destination countries in Europe are in a central position regarding the social, humanitarian and financial challenges caused by this situation. We have a particular role in the guarantee of basic protection to asylum claimants and in the reception and integration of newcomers in our society. Our cities are also the places where asylum seekers wait for a decision on their Refugee Status Determination process and where services are provided for them. Finally, it is in our cities that asylum claimants often remain as undocumented migrants if their asylum applications are rejected and return decisions are not applicable or enforced. Their exclusion from service provision would have a detrimental impact on social cohesion, public health and protection of fundamental rights". As they rightly assert: "no resettlement scheme can be successful if a reception place is not available at local level, if local civil society organisations are not involved and if awareness-raising and consensus building amongst the local population are not properly managed". All of these are key attributes that are required for an arrival and resettlement city to offer a safe and secure new home to those displaced. Whilst the negotiations of EU member states may be long and hard fought over policies of resettlement, quota allocation and discourses of ‘burden sharing’, the mix of political pragmatism and innovation often associated with cities might offer a different path forward. For while a number of European cities have been enrolled in projects to offer sanctuary to selected individuals, such as the ICORN Cities of Refuge network and varied Human Rights Cities approaches, these have remained simultaneously too disconnected from one another to forge meaningful solidarities, and too well connected to the state and its hierarchies of authority to offer an autonomous or critical response. In this context, there is a need for consideration of two key issues. Firstly, what lessons can be learned from past processes of urban refugee resettlement? And secondly, how might the voices of cities as key partners in responding to the needs of refugees be amplified to push for a migration agenda that has the needs of refugees at its heart? We might take each of these issues in turn in considering how cities may inform a response to the challenges of displacement. 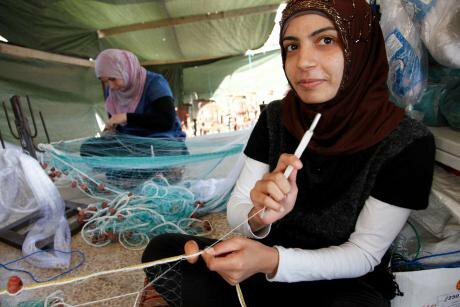 Syrian refugees producing fishing nets in Lebanon. DFID/Flickr. Some rights reserved.The history of urban refugee resettlement in Europe has not been one of an easy or politically stable integration process. Rather, resettlement has been a trial and error mode of managing displaced populations, often placing new arrivals in areas of social deprivation and often leaving communities to deal with the tensions of resource competition, xenophobia and misunderstanding. In the UK, for instance, the policy of dispersing asylum seekers to towns and cities across the country during the processing of their asylum claims, has had a troubled lineage. From initial instances of hostility, violence and harassment in some cities, to the emergence of fragile social support networks and infrastructures, the accommodation of asylum seekers provides us with a number of lessons to be mindful of when considering how any wider refugee resettlement might work. Firstly, the UK’s experience of resettlement and accommodation serves to highlight the importance of effective communication and community preparation in establishing the grounds for any response. Not only is strong communication required between urban authorities and national governments in terms of the scale and timeframe of resettlement, but these details need to be communicated to the public. This means not simply informing a community that refugees will be arriving, although this is a starting point that was often fatally forgotten in the early days of dispersal, but also doing the work of discussing resettlement with them: taking time to air views, consider opinions and examine the realities of life as a refugee. Without this communication, a vacuum can form in which rumour and tabloid sensationalism are reproduced without challenge. Given the media vilification of refugees in the Mediterranean context and in recent coverage of the ‘migrant crisis’ in Calais, the work of preparing cities for resettlement must start soon if this is to be a viable policy. Refugees in central Paris, France. Bench/Flickr. Some rights reserved.Secondly, moves towards community preparation will only succeed if they are matched with a recognition in political rhetoric that resettlement is both a humanitarian issue of rights and duties and, at the same time, an issue of urban development and change. The dynamism, creativity and innovation so often associated with successful cities, is in part traced back to their mobility – to the new ideas, people and networks they bring together in one place. As such, if cities are key to future refugee policy, they have to be seen as not simply ‘compassionate’ humanitarians concerned with the rights of the displaced. They have to also be recognised as communities, economies and cultures that stand to benefit from the arrival of new citizens. In the UK, the dispersal of asylum seekers has been argued to have promoted urban regeneration and the emergence of newly diverse communities in some cities, but the wider recognition of this way of thinking about refugee resettlement has been notably absent. Compared to the language of the ‘burden’ to be shared and the ‘quota’ to be accommodated, a recognition that asylum seekers and refugees may play a role in making successful cities and enhancing them as places to live is limited. Engraining such a discussion in both mainstream media and political discourse is therefore critical to shifting attitudes towards resettlement. Thirdly, it is important that resettlement and support services are appropriately funded, and situated within strong networks of communication between municipalities and other agencies. In a context of austerity, funding for asylum and refugee support is clearly an issue across Europe. 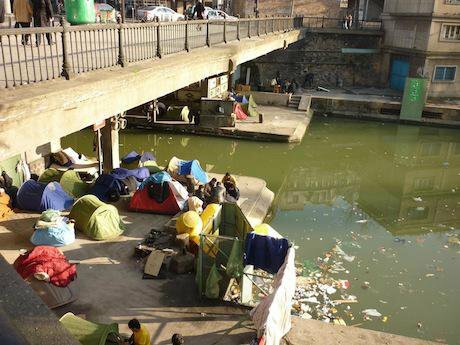 In the UK, John Grayson’s investigations of the privatisation of asylum housing for openDemocracy have served to illustrate the damage done to refugees' rights and wellbeing when accommodation and support are provided for the lowest possible cost. 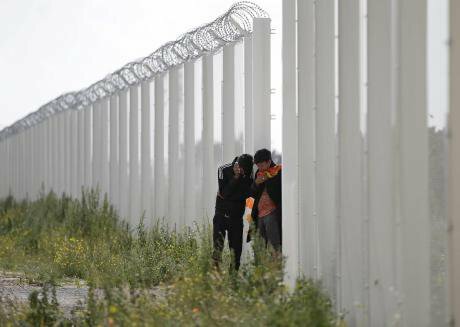 Migrants near a border fence in Calais. trust.org/Flickr. Some rights reserved.Importantly, it is not simply the quality of housing that suffers with such outsourcing, but also the effectiveness of communication between organisations and the clarity of boundaries of responsibility. Whilst we’ve seen significant investments made to militarise the external boundaries of the EU, such investment would be far better employed in enabling the infrastructure of resettlement to be put in place across Europe. Crucially, such infrastructure must extend beyond the lowest cost option. For dispersal and resettlement approaches to work, they require buy-in from a range of different actors (such as housing providers, NGOs, municipal authorities and support groups), but that support is easier to coordinate and manage when funded properly and when viewed as an investment in the future of the city, rather than as a debt paid to a burdensome obligation. Finally, effective urban resettlement requires that resettlement be connected into wider issues of migration and service provision. This means that asylum seekers and refugees need to be mainstreamed within both urban policy and provision, rather than being positioned as a marginal or ‘special’ interest. Of course, asylum seekers and refugees bring with them a series of vulnerabilities that may position them as distinct from other urban migrants, but this should not be used as a means to isolate them from broader discussions of how cities respond to migration. It is through providing opportunities to draw connections and equivalences across backgrounds, experiences and communities, that dispersal has promoted strong bonds of social solidarity and political engagement in some UK cities. Most notable here is Glasgow, where connections between asylum seekers, existing migrant communities and residents from socially and economically disadvantaged areas of the city have been tentatively forged around common concerns over austerity, marginalisation and stigmatisation. It is therefore important that refugee resettlement is articulated as an issue and a commitment that the city as a whole is engaged in. These four points indicate some, but by no means all, of the lessons we might take from past experiences of urban refugee resettlement. If cities are to be enrolled in new EU resettlement programmes these are concerns to be taken seriously. Yet, to revive some sense of urban sanctuary for those fleeing persecution would demand more than the conditions outlined above, as these conditions remain fixed within a system whereby cities must wait for the decisions of the state before acting. To take seriously the potential of European cities to offer an alternative path may thus require two further, more radical, steps. 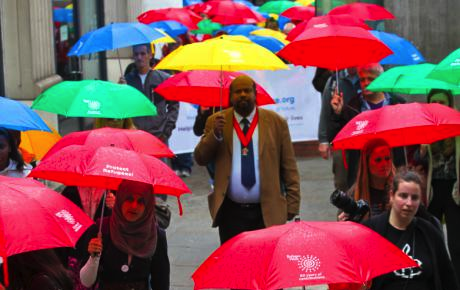 Bristol is declared a city of sanctuary. Iqbal Tamimi Demotix. All rights reserved.The first step is to ensure some level of urban political autonomy to develop a model of urban resettlement that advances the rights of refugees. Cities need room to ground their own practices and ideas on resettlement, to experiment, innovate and to learn from one another. This does not necessarily mean being in opposition to the nation-state or seeking resettlement policies that extend far beyond the constraints of national policy. But it does mean a position whereby cities are not afraid to be critics of those national policies and European frameworks. Thus, whilst the EUROCITIES network speak of the need for effective partnerships between municipalities, national governments and international organisations, for cities to be effective in protecting human rights, such partnerships cannot be structured around hierarchies of authority that dictate to cities at the expense of a more critical relationship. A critical distance is required between city and state. And, at the same time, a networking between cities around resettlement would serve to strengthen bonds of common interest and enable strategies of effective human rights protection to be communicated and translated between places. Whilst not all cities will be either interested in, or able to, support a more autonomous approach to refugee resettlement, there are signs that grassroots support in Canada, and sanctuary movements in Europe and the UK, may provide alternatives to the stalled attempts of national governments to agree approaches that protect the fundamental rights of those displaced. "Europeans must now establish a European network of cities that grant European citizenship to those who arrive at the continent’s frontiers. Each city can decide on a period of growing into the social fabric of the city, learning and following local customs, norms, and sociability, and democratic deliberation with the network". 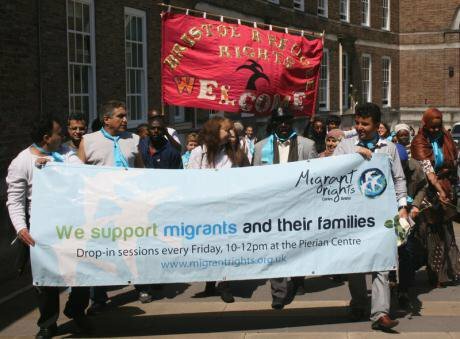 Protest for the rights of migrants. Flickr/Gustav Deghilage. Some rights reserved.Establishing citizenship through the city, and aligning this with rights to European mobility and residency, is a radical move in the context of an EU divided over freedom of movement and questions of human rights. Yet with coordination and cooperation between urban networks, it may offer a chance to move the question of refugee resettlement and protection on from the deadlock of nation-state quotas and closures. To return to those two conversations that opened this discussion, one of the arresting messages of advocacy groups in Calais has been the possibilities for hope and solidarity that arise when we stop viewing asylum seekers and refugees as ‘burdens’ and start seeing human beings. Whilst attempts to produce sustainable and socially just responses to migration may be stalled on the back of attempts to shift responsibility for the displaced to ever more remote regions across the world, moments of crisis also offer opportunities. They serve to highlight the contingency and fragility of normalised forms of managing migration and governing the displaced. In such moments, the failures of nation-states to address the needs of refugees and to take responsibility for displacement are all too evident. In such moments, looking to the city may offer not an easy solution, but an alternative, and potentially more humane, perspective.